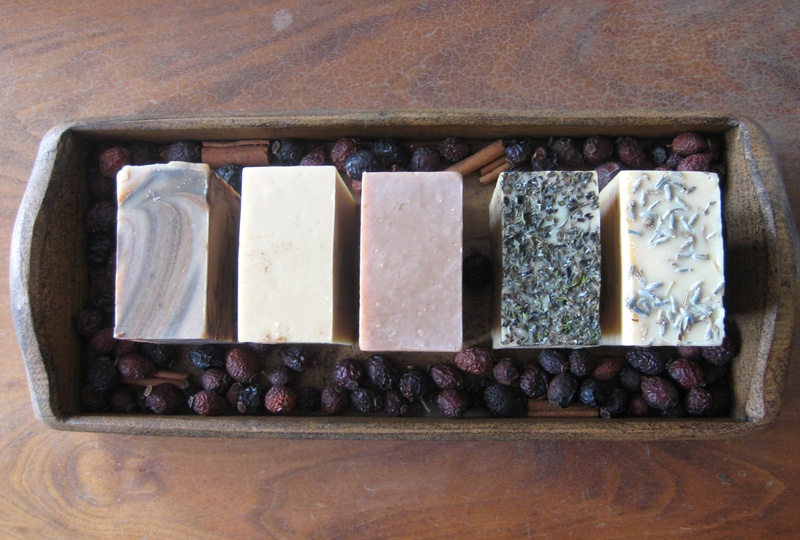 In eighteenth century America, soapmaking was a household chore. On soapmaking day, wood ashes were collected and mixed with rainwater. The resultant “leached” lye solution was mixed with molten tallow (beef fat, also rendered in the home) in an iron kettle over a brisk fire outdoors and stirred until it acquired the consistency of honey or jelly. The soap was then poured into mold or flat trays and allowed to harden and age. Soap is made of three basic ingredients: water, lye (sodium hydroxide or caustic soda) and oils/fats. “Saponification” is the chemical reaction created by combining oils/fats with an alkali and water. 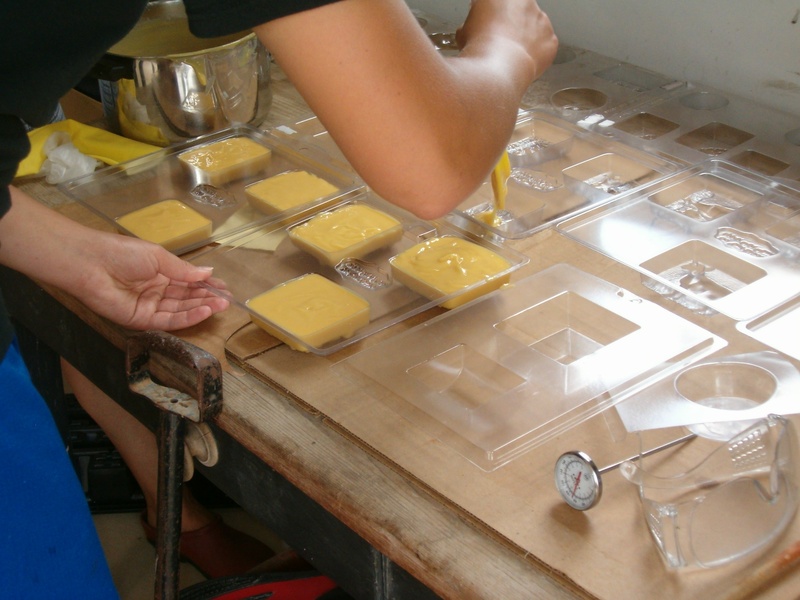 Today, most handcrafted soap makers use the ‘cold process’ method. Aside from the heat used to melt the solid fats to their liquid state, the heat produced by combining the precisely weighed oils or fats, alkali and water is sufficient to initiate the chemical reaction. Saponification is complete after the soap mixture has been poured into molds, cut into bars, and allowed to cure for several weeks. When properly made, the soap no longer contains lye, as the chemical reaction has converted the alkali (lye), water, and oils and fats into saponified oils and fats and glycerin. Soapers usually ‘superfat’ their soap – assuring an ‘excess’ of available fat to complete the chemical reaction, and also to create a luxurious soap! The end result is mild, pure handcrafted soap. You select the all natural & pure ingredients for their unique attributes/qualities! Luxurious, mild & gentle. Milk (we use our goat’s milk) is a natural emollient and perfect for all skin types. The chemical reaction between lye and fats produces glycerin which moisturizes the skin. TIP: For safety reasons, maintain soapmaking ‘equipment’ separate from every day household kitchen ware! TIN, IRON, ALUMINUM, TEFLON, should be avoided as lye will corrode them. Lye will slightly discolor wooden utensils. Always work on a protected surface in case of spills/drips and have some white vinegar near-by to neutralize spills just in case. Soap mold(s) – unique individual molds/plastic trays, usually with several cavities per tray, are available for hand-poured soaps, but, wood box-like ‘loafs’ produce hand-cut multiple bars of soap per batch of soap. These molds may require lining with butcher paper for easy release. LYE (or caustic soda or sodium hydroxide or NaOH) is a constant in all hand-crafted soap. USE ONLY PURE LYE. Lye requires caution in handling. Read the label. Wear safety glasses, gloves and a long sleeve shirt. Do not breathe the fumes. When working with lye, measure accurately and with purpose. Lye absorbs moisture as soon as the lid is open. Re-close promptly. Add the lye to the water or milk in a slow, steady stream while mixing the solution until dissolved. Do this in a well ventilated area and try not to splash. Use vinegar or lemon juice to neutralize “spills”. A few tips: ALWAYS WEIGH YOUR INGREDIENTS! This is not the same as ‘volume’. Also, don’t forget to account for, or subtract the weight of the container from the weight of the oil, lye, etc. This is called TARE weight. The weight of the water (or liquid) is not critical. It acts as the medium for the lye to react with the fats. Generally, the temp of the lye/water solution and the fats/oils are within the same range, a few degrees of each other (lets say within 95 – 110 degrees F) when they are combined…but follow your recipe. Saponification – The chemical reaction created by combining oils/fats with an alkali and water which converts the alkali (lye), water and oils/fats into saponified oils and fats and glycerin. Cold Process Method – A soap making method which uses no additional heat aside from the heat used to melt the solid fats to their liquid state. Tare Weight – The weight of a substance less the weight of its container. Exothermic Reaction – The chemical reaction that occurs when combining the precisely weighed oils/fats, alkali and water (or goat’s milk) produces heat during the soapmaking process. 1. Pre-weigh all ingredients and prepare soap mold(s). If you’re working with individual molds, always have a bulk mold ready on stand-by in case your soap set’s-up or seizes expectantly!!!! 2. Wearing protective mask/gloves, place water or frozen ‘slushy’ milk into large bowl and slowly add lye. Slowly stir the mixture with spoon until smooth. The lye will react with the water or milk and produce an exothermic reaction (releasing heat); bring the mixture to between 95 and 98 degrees F.
3. Melt the oil/fat together in one pot and bring to 100 – 110 degrees F.
4. Add the water/milk/lye solution to the fats/oil in a slow steady stream. DO NOT DUMP THE LYE/WATER solution into the oil. Use a spoon/hand blender to combine until the mixture demonstrates “trace” (drips leave a noticeable path in the mixture). Think…something like pudding or cake batter. This may take 15 – 45 minutes or more. 5. Using a rubber spatula, fold the mixture to remove bubbles. Transfer the mixture to a pitcher or pour the mixture directly into soap mold. 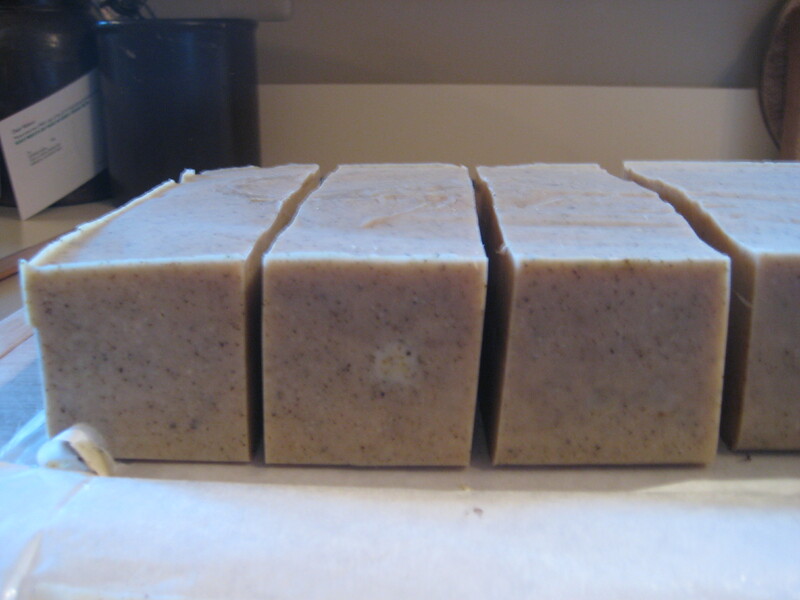 Note: You may add essential oils or botanicals, oatmeal, natural colorants etc to the soap at this point. Work quickly…don’t dilly dally. BEWARE – some ingredients hasten the set-up/cure – you’ll be scraping play dough into your molds!!! Nevermind, it all comes with experience. Did I mention you might want to jot down a few notes with each batch of soap you make? Start with a small 2 pound batch; a pure & natural recipe perhaps with readily available ingredients? Just in case you have ‘problems’ so you don’t waste lots of expensive materials like specialty oils and essential oils. 6. Cover the soap mold with cardboard or wood cover and blanket. Place in a cardboard/styrofoam box or insulated thermos cooler. The idea is to minimize heat loss and cure slowly over time. 7. After 24 hours, turn the soap out of the mold onto a wire baking rack (or something similar to ensure good air circulation). Cut your bars now if you used a bulk loaf-type mold and allow your soap to cure for about 3 – 4 weeks. HINT: There are many soap cutters on the market, but you can substitute a straight edge or wavy blade cheese cutter for a decorative edge or a kitchen knife – do not use a serrated edged knife. A cheese curd cutting knife works well for a really large loaf. Congrats – you’re a soaper! There are infinite resources available for soap recipes and ‘help’. Check your local library, bookstores and on-line soapmaking guilds. Find a ‘free’ soap calculator resource to verify soap recipes, especially when you begin to create your own mix of fats & oils and ingredients. www.pvsoap.com and www.soaperschoice.com are my fav. Seeing that no one else has commented I just wanted to say.Thanks for all your help I cannot wait to try this. I’m still a teeny bit terrified, but I’m sure I’ll get over it. Happy soap making to you! After every batch of soap, you’ll become more confident in yourself…expect a learning curve and you’ll do fine! Good luck! I purchased the last two of your soaps from the ‘Goats Milk’ molds at Knit Michigan in the Heritage booth, for gifts. They said the molds you use are antique molds. Perhaps you would tell more the molds, as I am sure I’m not alone in finding this interesting. Hello, That’s sweet…I do love the goat’s milk mold and kidding season is my fav time of year, but it’s not an antique. There is a large variety of soap molds in all shapes and sizes available on the internet to the soapmaker. ‘Antique’ soap mold were usually large wood boxes and soap was sold by the pound by cutting off a chunk. No fancy goatie images or otherwise! I still prefer to make a ‘loaf’ and hand-cut the bars rather than pouring individual bars…but they sure are cute! BTW, thanks for supporting Knit Michigan! So much information on your blog love it. Thank you for sharing! Wow – impressive post and congratulations on your soapmaking skills! Thanks for visiting my blog, too. I really appreciate and enjoy this information will try as soon as possible. Soap making and candle making will be my new hobbies. the finished products make wonderful gifts throughout the year for every one and any occasion . Hi Nicki! I don’t work much w/melt ‘n pour soap bases, so I can’t advise you from experience. Cold-process soapmaking is not that difficult. Can you take a local class(?) for your first how-to batch of ‘real’ soap. I think that would resolve your fears…especially with working with lye. And, yes, lots of fats/oils can be found in your local supermarkets! 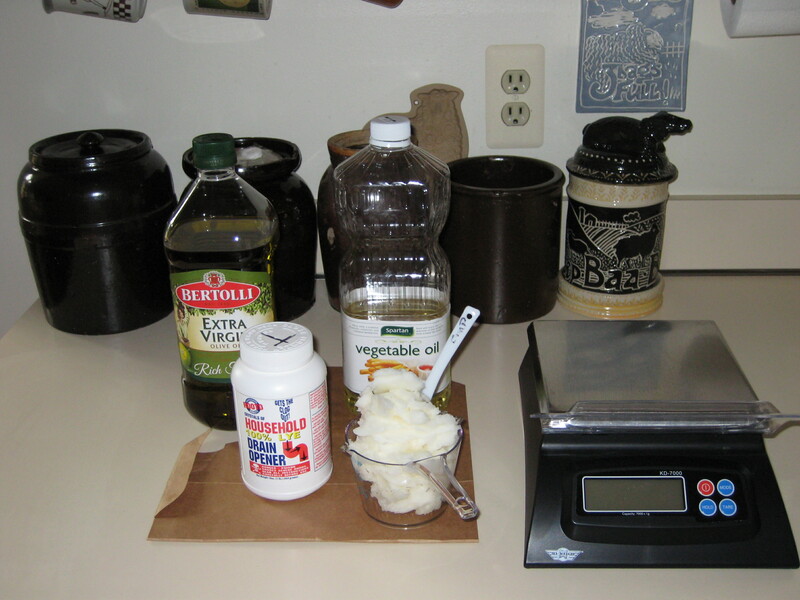 You should study-up on the properties of the fats/oils, find a recipe that you like and there’s lots of soap calculators to help you modify your recipe as you gain experience and confidence!